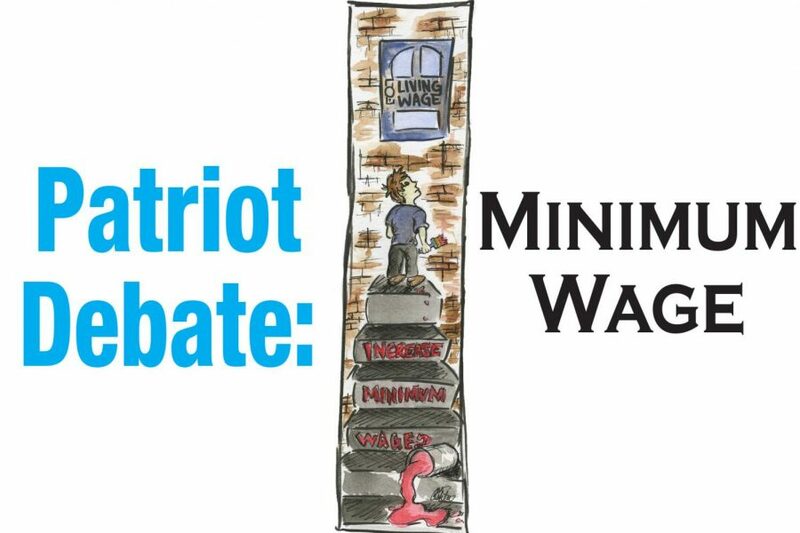 As demonstrated by the recent presidential debates, one of the major social, ethical, and economic dilemmas Americans face is whether or not it is feasible to raise the federal minimum wage. Minimum wage is defined by Investopedia as “The lowest wage per hour that a worker may be paid, as mandated by federal law.” Minimum wage is not meant to be a “livable wage,” but a way to prevent abuse by employers. Raising minimum wage is not a viable solution to poverty and will merely cause various economic calamities. One primary argument presented regarding minimum wage is that it is not a livable wage. However, the minimum wage is not meant to be a “livable wage.” A “livable wage” is not something that can be determined for a country that has areas of various economic development. Someone in Raton, Colorado requires far less to live on than someone who lives in New York City. A livable wage for someone in New York is substantially higher than someone in Raton. Historically, the federal minimum wage was created in 1938 under the Fair Labor Standards Act. The minimum wage was set at $0.25 and “has been raised 22 separate times–most recently, in July 2009, to $7.25 an hour,” according to the Center for Poverty Research, University of California. Simply put, the minimum wage was created to protect workers from tight-fisted and unethical employers who had no shame in overworking and underpaying their employees. While the era of American sweatshops may be gone, low-cost labor is still a critical component of the economy. Teenagers, myself included, do not need to make a livable wage. According to National Public Radio, “Americans ages 18-34 are more likely to live with their parents than in any other living situation.” About 50 percent of minimum wage workers are people under age 25, according to the United States Bureau of Labor Statistics. For people who are in high school, paying rent and buying groceries is statistically not likely. Minimum wage jobs provide students with an opportunity to help make car payments, go to dinner with friends, or afford miscellaneous purchases. On a similar note, people working a minimum wage job are generally not completing any highly skilled tasks. Elevating the minimum wage to $10.10 an hour means that someone working as a foreign car mechanic, like myself, is making the same amount of money as somebody who is working at a local fast food restaurant. Raising minimum wage merely devalues the labor of those who have spent years educating themselves for a more complex job. Raising the minimum wage on a federal level would mean that the monetary value of a specialized job currently with a higher hourly rate would be equal to somebody doing a relatively basic job. Why should somebody doing a complex job stay in that career path when they can make just as much money doing something far less taxing or complicated for the same amount of money? From a strictly economic standpoint, raising the minimum wage will not necessarily improve the quality of life for those living on a state’s minimum wage. If a small business owner is forced to pay their part-time employees more, a few things can happen. Prices of products may increase, the number of people able to be employed by the business may lower, workers could not work as many hours, or the owner’s profit margin might be cut. While large corporations with massive profit margins can afford to pay employees an extra $7.75 an hour, businesses with a handful of employees and a profit margin that barely puts bread on the owner’s table may not be able to sustain the higher price of labor. James Keller is a Media Editor for The Patriot and jcpatriot.org. Imagine working for 60 hours a week, nearly double the average 34.4 hours worked in the U.S., and barely staying above the poverty line. Now imagine doing this while supporting a family. This is the case for many minimum wage workers in America, with some earning as little as the hourly federal rate of $7.25. Raising the national minimum wage to $10.10 will improve the quality of lives of these individuals, helping them pass the poverty line. According to the Bureau of Labor Statistics, in 2016, there were 2.2 million hourly paid workers in the U.S. earning at or below the minimum wage. These 2.2 million workers comprise nearly 2.8 percent of American workers that are paid at an hourly rate. Assume that these individuals work 60 hours per week for all 52 weeks of the year without any breaks, only earning the federal minimum wage. In this case, they are earning an annual salary of roughly $22,620, while the average annual income is almost four times this amount, about $81,400. In 2017, the poverty line for a household of three resides at $20,420, and $24,600 for a household of four. Supporting and raising a family on low income creates an extensive list of issues. For starters, the prices of food continue to increase. While minimum wage remains stagnant, food prices have dramatically increased since 2009. According to the Huffington Post, as of 2015, the price of apples has increased 16 percent, the cost of bacon rose 67 percent, and milk went up 21 percent, with many other commodities following suit. With the prices of food increasing, and minimum wage remaining the same, individuals experiencing poverty not only rely on the support of the government, but also on the support of other citizens. They are struggling to provide the basic human right of food for themselves and their families. According to the Economic Policy Institute, 53.1 percent of individuals relying on public assistance are low-wage workers. Catholic Social Teaching explains that each person has the right to necessities such as food, shelter, and water as taught by Jesus. If this is so, then why are individuals often subjected to the harsh effects of low-income? Many believe that increasing the minimum wage to $10.10 an hour will cause a collapse or decline in the economy, but this is not factually supported. In fact, after 23 minimum wage increases in the U.S. since 1938, there are no accounts of economic collapse or significant job loss, a chief concern among those opposed. In addition, many people fear the effects that an increase in minimum wage will have on inflation. Past increases of minimum wage show no direct correlation between the two. In fact, following the 2009 increase in minimum wage from $6.55 to $7.25, inflation decreased by 4.2 percent and later increased only by 2 percent. Prior changes to the minimum wage follow similar courses, fluctuating between minor increases, decreases, or freezes of inflation, but overall no substantially significant change. By increasing minimum wage, a worker’s salary is raised, improving his or her quality of life. For some, this includes the ability to support a family, while for others, it provides opportunity for higher education and personal growth. Individuals raised in poverty are not only limited in terms of resources, but they are often denied the chance to become educated, limiting their personal ability to escape the cycle of poverty. Each working U.S. citizen should be granted the same ability to live life knowing that they are being compensated in a way that reflects the time and efforts they are expending, or at least are earning enough money to put food on the table. That being said, the minimum wage should be raised in order to support the lives and dignity of those struggling to stay out of poverty. Amelia Bothwell is a Community Editor for The Patriot and jcpatriot.org.